The funniest thing in the exhibition area today was this card by Dave Walker. I was disturbed to come back this afternoon and discover he has had a “Cease and Desist” order served on him from Texas, arising from blog entries tracing the fate of former SPCK Bookshops. The news itself has now disappeared from Dave’s site — surely not a censorship notice censored?! SPCK used to be a worthy chain of Christian bookshops, often in Cathedral cities, run by a slightly retro but worthy charity. Faced with mounting losses they turned to the Saint Stephen the Great Trust — a robustly Conservative Texas Orthodox outfit. 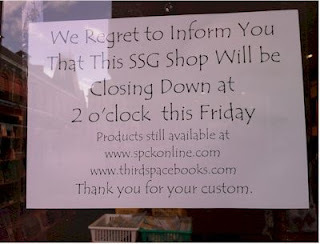 SSG planned to grow the bookshops as a resource against secularism. Two years on, this plan is in tatters, amidst recriminations about bad labour practice and unpaid bills. One former manager has, tragically, taken his life. 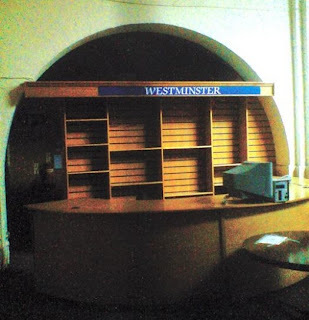 The contents of the stores have been weeded of unsuitable content, stock has plummeted, the public have deserted the shops, and some have closed. Plainly the skills required to sabre rattle for reactionary causes are very different from those you need to run a bookshop, let alone re-evangelise England. Former Staff had been filing inside stories on Dave’s blog. Now a gagging order has been served and, unable to risk high legal costs, Dave has had to comply. I have only loosely followed the story, but I can’t remember anything remotely actionable on Dave’s site. Now it’s been taken down I wonder what SSG was so ashamed about that it wanted it suppressed? The rapid and pathetic decline of the bookselling business betokens management way out of its depth. Its latest behaviour raises questions also about bullying and free speech. Heavy handed or what? 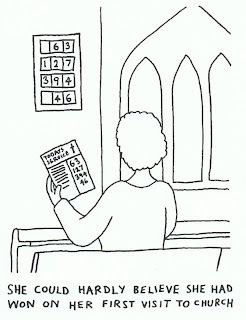 from where a number of other have copied it to their blog.